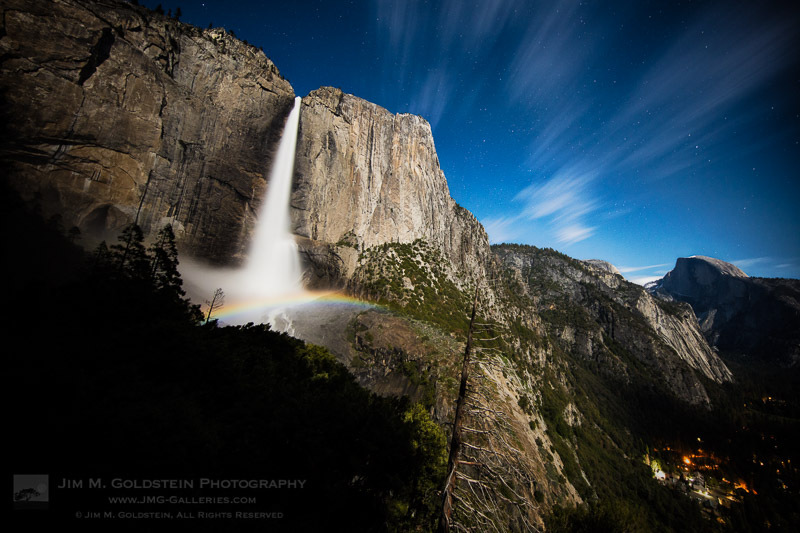 A moonbow (AKA lunar rainbow) spans across upper Yosemite Falls with passing clouds and Half Dome in view. This past week I ventured off to Yosemite to capture moonbows. Midway through my trip I met up with Brian Hawkins who twisted my arm ever so slightly to make a hike to upper Yosemite Falls for a moonbow shoot. The last time I ventured up to this location I did so solo and while I got great photos it was a grueling hike with the amount of gear I was carrying. For whatever reason this time around while carrying the same amount of gear the hike didn’t seem so hard. I chalk that up to great company keeping my mind off of the hundreds of switchbacks. Long story short the entire hike and shoot lasted 11 hours leaving on Thursday at 5pm and returning back to the valley floor at 4am. Photographing Moonbows in Yosemite (taken Thurs. at midnight). Photo courtesy of Brian Hawkins. While the effort was exhausting, the end result is one that I’m proud to share. Conditions turned out great and no one twisted an ankle or squashed one of the dozens of millipedes on the trail. Canon 5DS R, Canon 11-24mm at f/4, 11mm, ISO 640 and 30 sec.